I’ll go ahead and rat myself out, towards the end of my pregnancy I spent an obnoxious amount of time at Ulta and Sephora. I justified these trips because Ulta kept sending me 20% off coupons. It became such a bad habit that my girlfriends would send me their Ulta coupons because they knew I kept going there to kill time until I gave birth. And who am I to let a good coupon go to waste?! 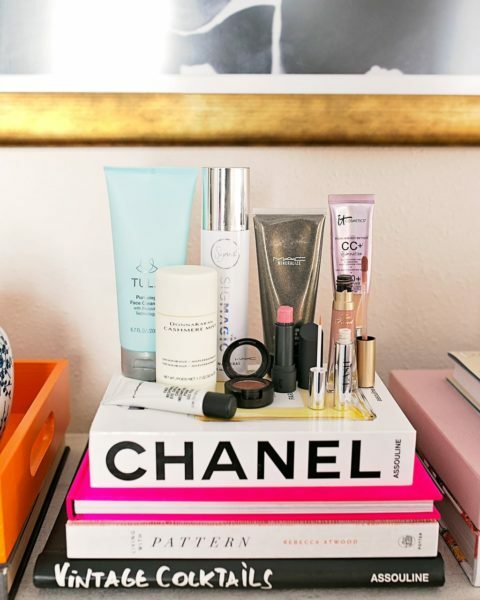 Needless to say, I found a lot of new beauty products that have been part of my makeup routine the past few months as well as products I wasn’t in love with. 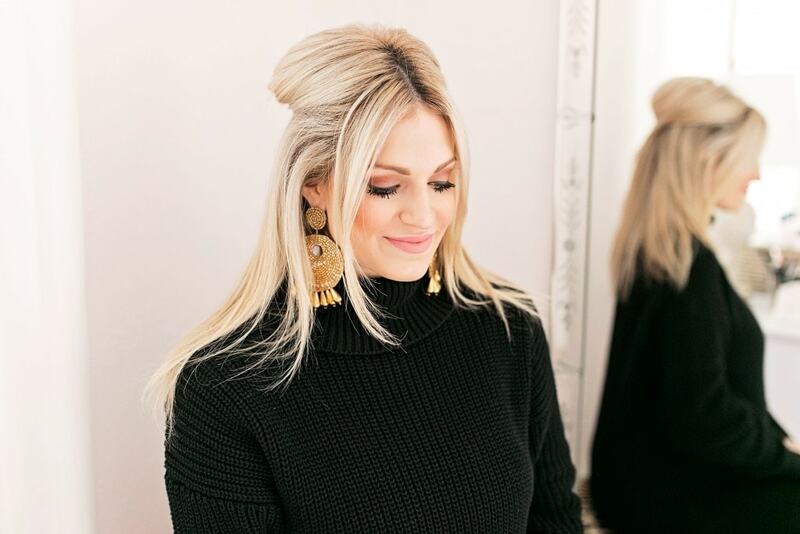 I thought today I would share my updated makeup routine to give you an idea of what I’ve been wearing on repeat. Primer: For the past two months I’ve been using the First Aid Beauty Coconut Skin Smoothie Primer. Primer is actually what got me started on all these “makeup runs” to begin with! I was finding that the primer I was using [Makeup Forever] was causing my makeup to separate on my face. This primer moisturizes, brightens, blurs imperfections and makes your skin dewy. It smells like a trip to Maui and keeps my makeup on all day! Foundation: It Cosmetics has been one of my favorite foundations for the past few years! Generally, I wear the CC+ Illumination Cream in shade Light. I blend it out with a damp beautyblender. About a month ago I was sent the It Cosmetics Confidence in a Compact Foundation which has a skincare serum in it. I love this just as much as the CC Cream! I actually think this is a bit lighter than the CC Cream and I blend it out with a foundation brush. This is the foundation I had on when I gave birth and my sister kept asking what was on my skin because it lasted until the next day, haha! I love that both of these products have SPF 50 in it, so no matter what I do during the day I feel protected. Concealer: Since college, I’ve used the Clé de Peau Beauté Concealer in shade ivory. This stuff covers everything without feeling cakey. I was originally referred to this concealer by my dermatologist as a way to help with my discoid lupus. I’ll be honest, it is really pricey! But I only use one stick a year [if that!] so if you have acne scaring or acne and want something a bit more full coverage, I can’t say enough good things about this! For my under eye concealer I use Tarte Shape Tape in Fair. Powder: On a normal day, I don’t use powder. However, if I’m shooting or going somewhere nice like a wedding, I set my foundation with a powder. Generally, powder for your under eye area is a “no-no” but I’ve found the Hourglass Ambient Lighting Powder in Ethereal Light is the prettiest powder for setting the concealer and keeping the skin bright! It also doesn’t settle in fine lines. For my t-zone I use Laura Mercier Candleglow Sheer Perfecting Powder in Light. It blurs the look of imperfections and gives your skin a really healthy glow. Contour: To contour, I use Too Faced Sweethearts Bronzer in shade Sweet Tea. Blush: When it comes to blush, I’m a huge fan of anything by NARS. Since December, I’ve been using the NARS NARSissist Unfiltered Cheek Palette. These blushes are perfect on their own, but I also just swirl my brush in different shades each day and they blend beautifully. If you have a darker skin tone, this palette would be perfect for you! Highlight: Highlight palettes are all over the market, but I generally stay in a committed relationship with MAC when it comes to brightening up my face. My favorite since college has been Mac Soft and Gentle. It’s what I wore on my wedding day [you can see that tutorial here]! Brows: I also never cheat on Anastasia Brow Wiz in Blonde. I find that so many other brow pencils are too waxy or don’t have the right amount of pigment to them. The only downside is I go through this product so quickly! I generally have to buy a new pencil every month and a half. Eyeshadow: This is where my daily routine varies a bit! I keep three eyeshadow palettes on rotate throughout the year: Modern Renaissance by Anastasia, Viseart Theory Minx and a palette I made by MAC. The shadows in my MAC palette are: Sable, Cranberry, Soft Brown & Brule. I wish I could say I have a rhyme or reason to which one I use day-to-day, but I don’t! However, I can say my overall thoughts about each palette to give you an idea of which one you may prefer! My favorite palette in terms of smooth shades is the Viseart Theory. I also think these are the most pigmented shade options, they seriously feel like crushed velvet going on your eyelids. When it comes to a more natural look, I like the MAC palette. MAC isn’t necessarily known for “natural” makeup, but I find that the shades I use can be built up and look light or smokey depending on what look you are going for. In terms of being able to create lots of different looks, I love the Modern Renaissance one! This is the palette I grab while traveling because I can do anything from a soft, peach look to a fancy, smokey eye! This palette is also such a good gift to keep on hand for a girlfriend’s birthday! Liner: Lately, I started using Charlotte Tilbury Liquid Eye Pencil in Bedroom Black. This is a waterproof liner that gives the look of a gel liner, which is my favorite to wear! I just hate how quickly gel pots dry out. Mascara: My two favorite mascaras I’ve been using are Stila Huge Extreme Lash and Tarte Maneater! I layer these two together and it gives the look of lash extensions! Lip liner: This is the product I’m most excited to share! I find lip liners to always be a little difficult to fall in love with. They might be really dry like MAC liners or overly creamy like Makeup Forever. Once you find the texture you prefer, it’s always hard to find one universal shade that can go with numerous lipsticks. About a month ago I found the perfect one and I picked up a few extra just because I didn’t want to ever run out! Stila Stay All Day Lip Liner seriously doesn’t budge! I put it on right after my water broke at 6:45 in the morning and it was still on when I delivered Maxi at 8:04 that night! Haha! My favorite shade is Pink Moscato. It shows up very mauve! Setting Spray: I’ve been testing a few different setting sprays the past few months, and I still love my tried-and-true Urban Decay All Nighter Setting Spray best. I don’t use this every day, but I do use it for days I’m shooting and it combats rain, humidity or extreme heat! 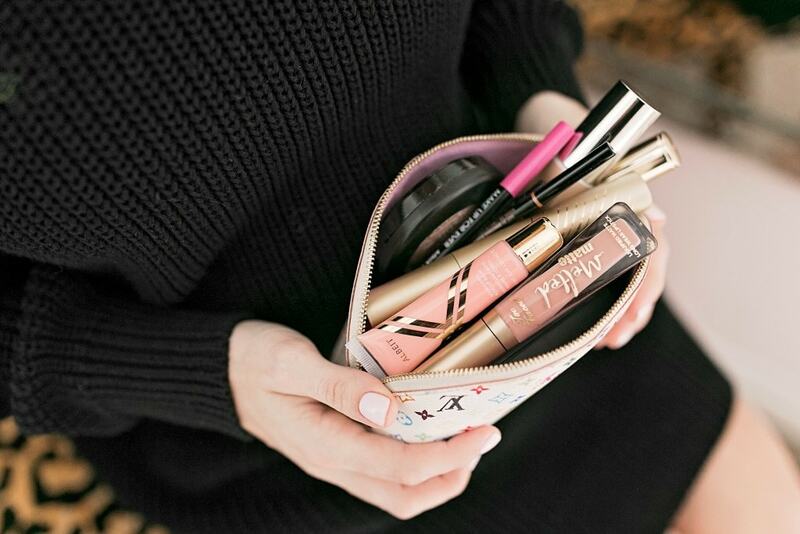 Do you have any favorite makeup products in your kit?! 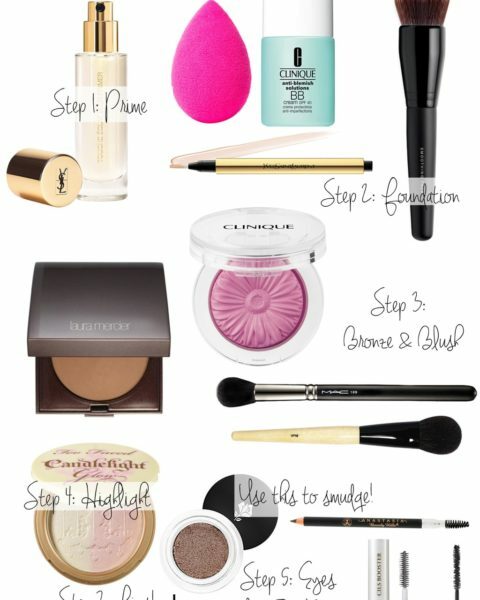 See the brushes I use in this post! 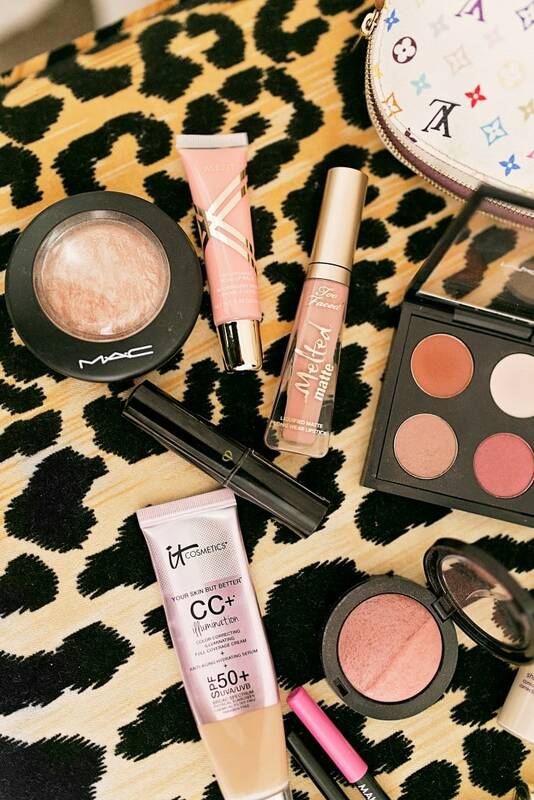 I’ve been a big fan of Mac products for as long as I can remember, but I’ve never tried their highlighter. I should get to it! I wore Baci on my wedding day! I need to pick it up for myself, but I have a love/hate with liquid lipsticks. 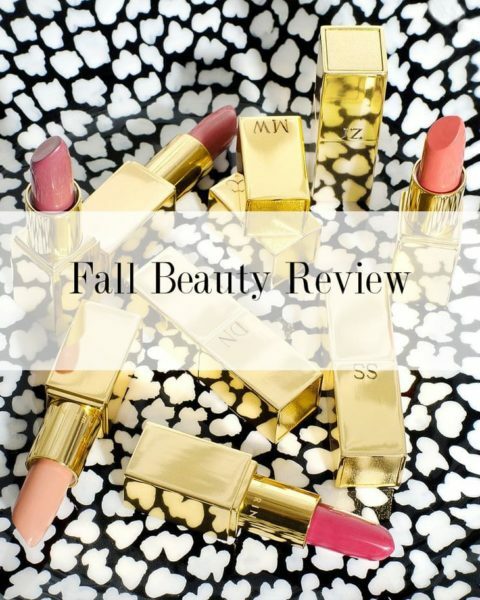 You should try the Bare Minerals matte lipsticks! I just picked up the color Slay and love it. Love these earrings! Found them on Neiman Marcus Last Call for $40! I LOVE Stila and Kat Von D for lip products! Check out Stila’s shade Perla and Kat Von D studded lipstick in shade Lovecraft. It has a slight purple undertone which makes your teeth look white, and it stays all day! I literally put it on and can eat tacos, drink lemonade and it sticks. When it does start to fade it just makes your lips look a natural mauve/rose color. It has that matte look but it’s not drying at all and doesn’t leave that weird feeling on your lips that a lot of matte liquid lipsticks do when you’re eating. I’m totally going to pick up Too Faced Child Star! Thanks Katey!!! I love my Anastasia Brow Wiz! I never knew my brows were capable of looking that good. I’ve never been a huge makeup lover but I’m slowing starting to break out and try new products so need to pick a few of these up to try on my next Sephora run! I have the IT Cosmetics CC cream. I like it but sometimes I fee like it doesn’t last throughout the day. I’ll have to try the new one since it lasted you through labor! I love these kind of posts! 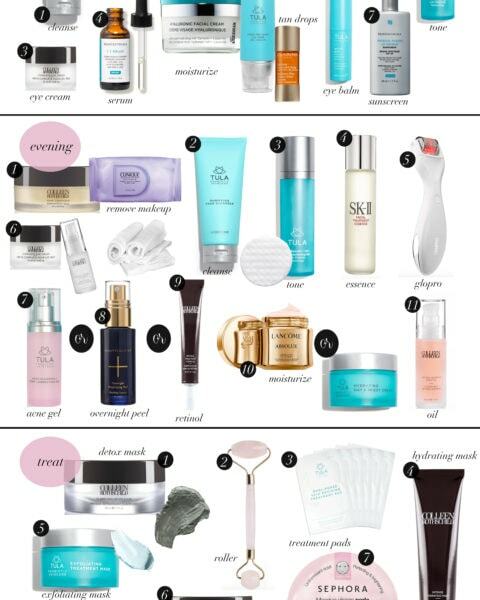 Do you use the it cosmetics cc cream when you’re doing photo shoots? I have always wanted to try this product but am worried to have flashback because it had SPF? Have you had this problem! Love your blogs! This is the only foundation with SPF that I don’t have flashback issues with! I use it while I shoot and I’m so glad it doesn’t do that on my skin! Thanks for sharing, I love these types of post! Do you use the Stila lip liner only as an actual liner or do you put all over your lips? I have heard of people doing either/ both. I’ve always wondered, do you put lip liner just around the edges or all over your lips? It’s always intimidated me so I just don’t try haha but the way you described that Stila one, I want to give it a whirl! I have tried a few different lip liners that claim staying power, but haven’t seemed to found “the one”. 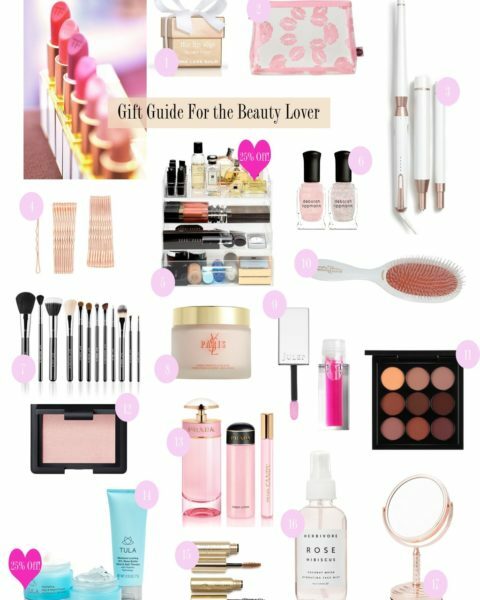 I am definitely going to try the Stila ‘stay all day’ after your recommendation! 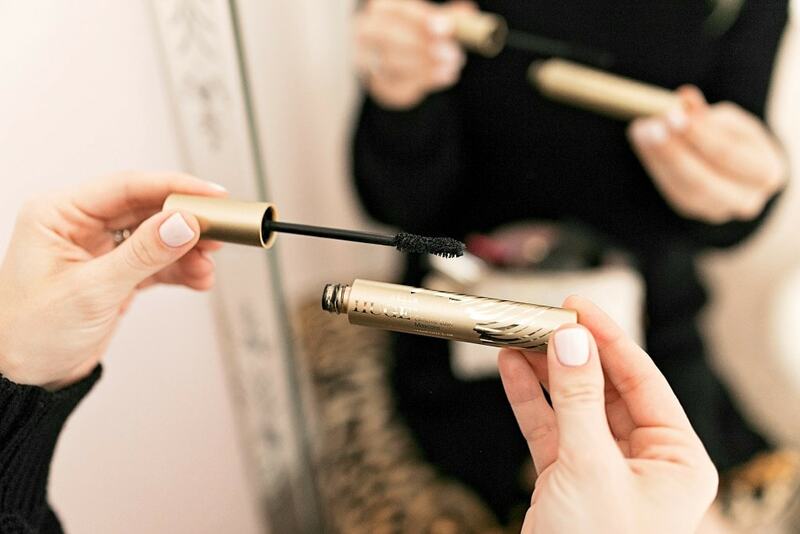 Estee Lauder Double Wear Lengthening mascara is my HG. 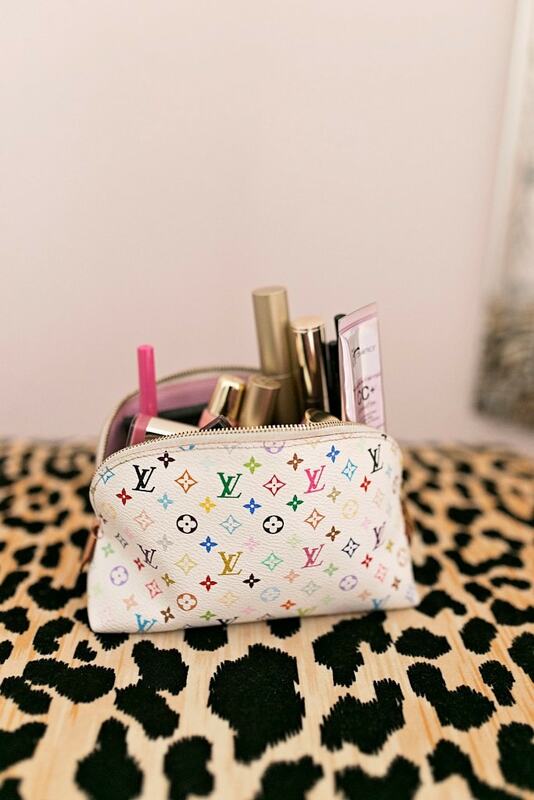 For years I struggled with black smudges under my eyes – even with waterproof mascara. It just made me feel so….not pretty! But the double wear mascara stays on ALL day. It flakes a teeny bit, but that can just be brushed away. 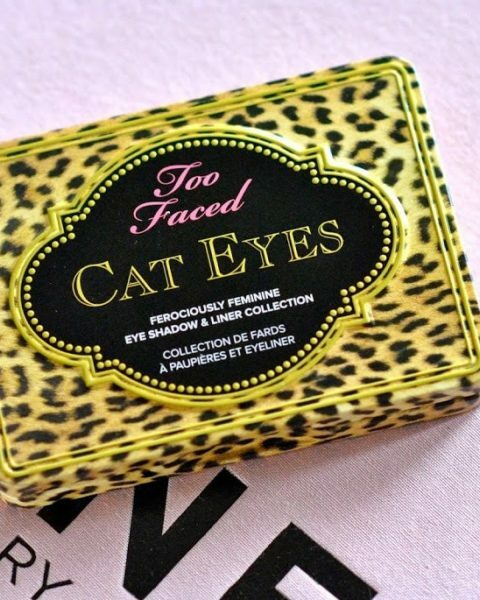 It does not smudge or get any black under your eyes. AND it comes right off with a little cleanser and water. So amazing! I can’t wait to try that concealer, Katey! I’ve been meaning to get myself it cosmetics foundation!! Girl I’m right there with you, I totally justify going to Ulta with the coupon! haha. I recently started using the FAB primer too, it smells like the beach to me! I’ve also been wearing it alone on the days I don’t want to wear makeup and it just makes my face look put together if that makes sense! I hope you & your sweet baby Maxi are doing amazing! !